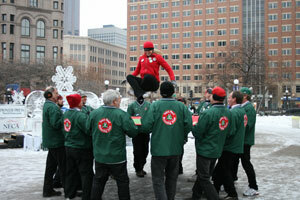 The Saint Paul Bouncing Team, Inc. is a nonprofit corporation organized under the laws of Minnesota. The team operates as a volunteer athletic association and is comprised of volunteer members. It is necessary that we supplement our members' contributions by charging an event fee to recover related expenses. These charges depend on the nature of the event, location, and mode of travel. 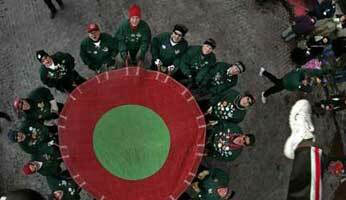 Moreover, we need at least 20 members to properly and safely perform the bounce. Fees are generally $750 per event. Price is subject to change and negotiable. Tell us your story, and we'll be happy to talk. Circumstances demand that we provide our member-volunteers with as much advance notice as possible, especially near holidays and summer weekends. Email president@stpaulbouncingteam.org for further inquiries. Thanks for stopping by!